It’s Holy Week for Christians, the week we remember the last days, Passion, Death, and (ultimately) the Resurrection of Jesus of Nazareth. The vast majority of all Christian knowledge about the death and resurrection of Jesus comes from the four canonical gospel accounts, each of which records in some detail the events leading up to Jesus’ crucifixion and death. And since that historic Friday almost 2,000 years ago, a great deal has been written (and drawn, painted, scripted, and produced) about the passion of the Christ. And despite what some scholars and news outlets claim this time of year, most scholars conclude that its safe to say that we know a good deal about the events surrounding the death (and resurrection) of Jesus. Perhaps the most widely known tradition concerning apostolic martyrdom is that of Peter who is said to have been crucified in Rome upside down during the reign of the Emperor Nero (typically dated around 64 CE). 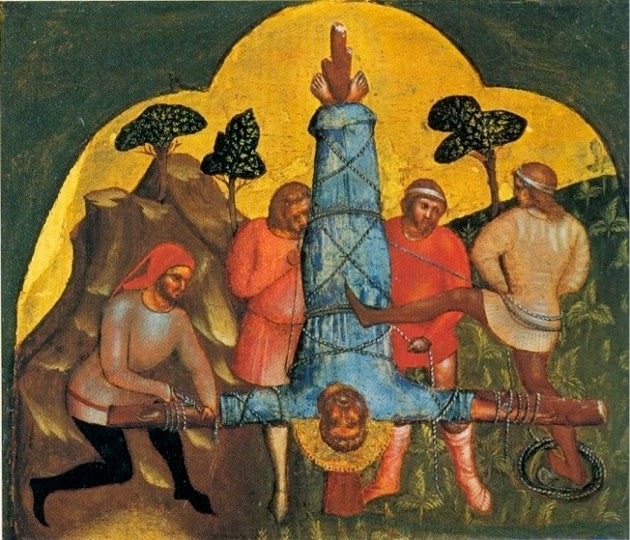 According to tradition, Peter felt unworthy to die in the same manner as the Lord Jesus, and thus was apparently crucified upside down on an x-shaped cross. James, brother of John (not to be confused with any of the other prominent James’ in the early church), was executed with the sword in Jerusalem, and is generally understood to have been beheaded. Some traditions hold that one of the Roman guards assigned to watch him was so overcome by James’ faith that he joined him in his execution. The apostle John faced martyrdom during a wave of persecution (likely either under Nero and/or Domitian) and according to tradition survived being boiled in a vat of boiling oil without harm. Due to this, John was apparently exiled to the island of Patmos, where he may have written the Apocalypse (Revelation). Traditions remains somewhat divided as to whether he died on Patmos or returned to Asia Minor, though in either case John is understood to be the only Apostle to have died peacefully. Bartholomew (Nathaniel) traditionally went as a missionary to Asia Minor (present day Turkey), where he was flayed to death with a whip in Armenia. Unbeknownst to most modern day Christians in the West, the Christian church long thrived in Armenia, a location where writings later included in the New Testament canon were widely circulated. Tradition holds that Andrew was, like his brother Peter, crucified upside down on a cross, though in Patras, Greece. After being severely whipped and tied to the cross to prolong his agony, Andrew apparently preached to his tormentors for several days before passing away. 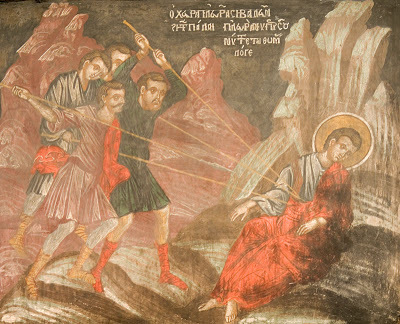 The apostle Thomas has several different traditions concerning his missionary work and martyrdom. One of the earliest indicates that he traveled to present day India and established several churches before being killed with a trident by a Brahman priest. Of special note concerning this tradition was that when later missionaries came to India several hundred years later, they found extant copies of what appeared to be the Gospel of Matthew circulating among the Christians already on the subcontinent. Matthew (historically understood to have been the evangelist who wrote the gospel) traditionally suffered martyrdom in Ethiopia after writing his gospel. Traditions concerning his death are somewhat scarce, though he seems to have been killed via the sword. 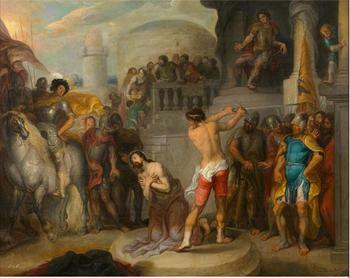 James the Just, brother of Jesus and leader of the early church in Jerusalem, has the clearest evidence concerning the circumstances surrounding his martyrdom, as the Jewish historian Josephus (Antiquities 20.9) records that he was killed under the direction of the Jewish High Priest around the year 62 CE. Some have argued that a different James (perhaps James son of Zebedee, John’s brother) was the James killed in 62 CE, with Church Fathers such as Hegesippus and Clement of Alexandria apparently reporting his date of death closer to 69 CE. In either case, traditionally James was thrown from the pinnacle of the Temple and then beaten to death by a mob. The evangelist John Mark (traditional author of the gospel bearing his name) apparently died in Alexandria, Egypt after being dragged through the streets by a team of horses. Jude, author of the canonical Epistle of Jude and traditional half-brother (or adopted brother) of Jesus is traditionally understood to have been shot to death with arrows. Matthias, the man chosen to replace Judas Iscariot in the Acts of the Apostles, was likely stoned and then beheaded. The evangelist Luke (traditional author of the gospel bearing his name) was allegedly hung in Greece sometime in the late 60’s or early 70’s CE for preaching too boldly there. And finally, Paul (formerly Saul) of Tarsus was beheaded by the Emperor Nero in Rome (he wasn’t crucified because he was a Roman citizen). The traditional dating for Paul’s death hinges upon a number of factors, including a dating of the chronology of his letters and the account given in the Acts of the Apostles. Paul many have been martyred around 64 CE, though many church traditions indicate that he was released after the imprisonment recorded in Acts and travelled for a few more years before being against arrested and sentenced to death. Why do I share these traditions this Holy Week? At least in part because these narratives offer a historical glimpse into how convinced early followers of Jesus were of the truth of the Christian faith. The earliest followers of Jesus did not expect to live the easy, persecution free lives that many of us assume to be normal. May the faith and example of these Christians spur us to stand for the truth of Christ’s life, death, and resurrection, even in the face of death. Also, martyrdom has nothing do with proving the accuracy or authenticity of Gospel resurrection tales. If the apostles did all die martyrs (historians have raised questions, especially based on totally divergent tales in many cases), they probably were not killed because they refused to recant that Jesus had risen from the dead. The Christian refuses to burn incense before the statue of the master of the legions of Rome. He believes the terrestrial power will soon pass away; he has no sympathy with it. He looks forward to a speedy overthrow, a terrible retribution…Moreover, he hopes for a heavenly crown. He likely is a slave of a long enslaved race, despised, downtrodden here: he believes he will be before the throne of God with the elect in Heaven. The balance of pleasure is clearly on the side of martyrdom. On the other hand, the unbelieving philosopher or heretic is resisting all the orthodox Christian influences under which he has been brought up.In the opinion of those who have brought him up, he is casting away his hopes in the future world. He has, perhaps, no sure belief in a future recompense for himself; the triumph of his cause is very distant, and must come very gradually. Yet for what he believes to be truth–for that alone he dies. Which martyrdom testifies most to the truth of the opinions of the martyr? There may be a greater testimony to truth in the mere refusal of an honest and intelligent man to enter the Church, than in the excited devotee running towards the lions in the arena.